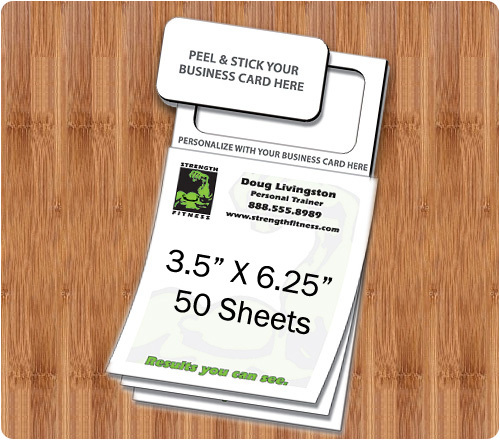 A 3.5 x 6.25 peel and sticky magnetic scratch pad can be favored by advertisers who wish to offer value and cost effective business gifts. This scratch pad possesses 50 sheets, and peel and scratch area, where advertisers can choose to affix their business cards. Also, they can get those sheets customized with business information. People who receive this attractive magnetic scratch pad will always make it a point to keep it over refrigerator door because it reminds them something or the other, which needs to be wrapped on urgent basis. Prices include one (1) to four (4) color imprint including full-color (four color process) on one side, and up to 30 minutes of art setup time. Exact color matches, metallic or fluorescent colors cannot be printed in full-color (four color process). Image bleeds are not available on note pad orders. Color of product is white. Material is 50 lb. offset only.